Trigeminal neuralgia is treated on an outpatient basis, unless neurosurgical intervention is required. Management of this condition must be tailored individually, based on the patient's age and general condition. In the case of symptomatic trigeminal neuralgia, adequate treatment is that of its cause, the details of which are out of the scope of this article. Because most patients incur trigeminal neuralgia when older than 60 years, medical management is the logical initial therapy. Medical therapy is often sufficient and effective, allowing surgical consideration only if pharmacologic treatment fails. Medical therapy alone is adequate treatment for 75% of patients. Patients may find immediate and satisfying relief with one medication, typically carbamazepine. However, because this disorder may remit spontaneously after 6-12 months, patients may elect to discontinue their medication in the first year following the diagnosis. Most must restart medication in the future. Furthermore, over the years, they may require a second or third drug to control breakthrough episodes and finally may need surgical intervention. Simpler, less invasive procedures are well tolerated but usually provide only short-term relief. At this point, further and perhaps more invasive operations may be required, and with these procedures the risk of the disabling adverse effect of anesthesia dolorosa increases. Thus, treatment can be subdivided into pharmacologic therapy, percutaneous procedures, surgery, and radiation therapy. Adequate pharmacologic trials should always precede the contemplation of a more invasive approach. Adjunct treatments such as mechanical, electrical, and thermal stimuli sometimes modify pain with fewer adverse effects than medication. Self-adhesive bandages may also be used. Depression is often seen in patients with trigeminal neuralgia; thus, this underlying depression should be adequately treated. Tricyclic antidepressants (eg, amitriptyline, nortriptyline), as well as sodium valproate or pregabalin, have not been well studied. Amitriptyline (Elavil) can be tried, but the success rate is low. Antiepileptic drugs (AEDs) work well for trigeminal neuralgia (TN) and have been known to do so since a study was completed with phenytoin (PHE) in 1942 (Bergouignan) and another with carbamazepine (CBZ) in 1962 (Blom). With 3 placebo-controlled crossover studies validating its efficacy in trigeminal neuralgia, providing relief by roughly 75% versus only 25% in the placebo arms (Killian, Nicol, Campbell), carbamazepine is the best studied drug for this disorder and the only one with US Food and Drug Administration (FDA) approval in this setting. Since the carbamazepine studies, however, newer second- and third-generation AEDs have expanded the choice of AED in trigeminal neuralgia, having demonstrated their efficacy in a variety of neuropathic pain syndromes, including trigeminal neuralgia, as well as in painful diabetic polyneuropathy and postherpetic neuralgia. Other anticonvulsant agents possibly useful in the treatment of this disorder include sodium valproate and clonazepam (Klonopin). Clonazepam has moderate efficacy but is not recommended because of a low level of evidence and its adverse effects (eg, sedation) and dependence. The National Institutes of Health (NIH) currently is sponsoring studies of topiramate. Because patients with trigeminal neuralgia will be using medications for years, perhaps decades, their cost is relevant. Generic carbamazepine is the cheapest; costs vary widely for the other agents, depending on the source, but approach a 4-fold increase for generic gabapentin (GBP), 8-fold for lamotrigine (LTG), 10-fold for topiramate (TPM), and 20-fold for oxcarbazepine (OCB) in moderate daily doses. To justify these hugely higher costs, providers can point to the promise of improved tolerability of the new agents, often a determining factor in a person with multiple sclerosis or with advanced age. Some drugs do not affect serious idiosyncratic hepatic and hematopoietic reactions, eliminating the burden and cost of routine laboratory monitoring. Some agents offer more linear pharmacokinetics and fewer drug-drug interactions, facilitating combination therapy. Some pose less long-term risk for osteoporosis. Furthermore, some drugs do not autoinduce their metabolism, simplifying dose titration and adjustment. Most of the literature on medications for trigeminal neuralgia consists of case series, uncontrolled studies with less than a dozen subjects, or small randomized clinical trials, so the apparent efficacy of the drugs requires confirmation through well-designed, large, phase III trials. The controlled data published for lamotrigine and baclofen (BCF) is promising but derives from studies with only 14 and 10 subjects, respectively. No controlled data exist for the use of phenytoin, clonazepam, sodium valproate, oxcarbazepine, gabapentin, or mexiletine in trigeminal neuralgia; similarly, no controlled data exist for the common practice of adding a second drug when the first fails, except for the addition of lamotrigine to carbamazepine. No head-to-head comparison studies of these agents exists, and only one surgery versus medication study has been published, limited to refractory trigeminal neuralgia, a small (n = 15) trial. Only one Cochran review of medications for trigeminal neuralgia exists, and it looks only at carbamazepine, the traditional favorite. Confusion arises over outcome measures, as some researchers accept only complete relief of pain, whereas others accept partial relief. Serum levels of the anticonvulsants in ranges appropriate for epilepsy may be necessary, at least to control the initial symptoms of trigeminal neuralgia; a much smaller maintenance dosage may be adequate thereafter. Because this disorder may remit spontaneously after 6-12 months, patients may elect to discontinue medication, only to restart it when the pain recurs. Once a patient experiences breakthrough pain on a single agent, a second and even third additional medication may be required to restore relief, at which point, many seek a surgical solution. Resistance develops anywhere from 2 months to 10 years after treatment begins with the most studied and successful drug, carbamazepine. Anticonvulsant medications pose risks of sedation and ataxia, particularly in elderly patients, which may make driving or operating machinery hazardous. They also may pose risks to the liver and the hematologic system. Thus, documentation of patient education about these potential risks is important. Patients also need to understand that medications for trigeminal neuralgia are only palliative and often are of limited and temporary value. They also must be informed thoroughly of the risks involved with neurosurgical interventions, including anesthesia dolorosa. Carbamazepine and oxcarbazepine are considered first-line therapy in trigeminal neuralgia (TN). [29, 30] Lamotrigine and baclofen are second-line therapy. Other treatments are third line and the evidence for their efficacy is scant. Carbamazepine acts by inhibiting the neuronal sodium channel activity, thereby reducing the excitability of neurons. A 100-mg tablet may produce significant and complete relief within 2 hours, and for this reason, it is a suitable agent for initial trial, although the effective dose ranges from 600-1200 mg/d, with serum concentrations between 40-100 mcg/mL. Indeed, serum levels of carbamazepine (but not necessarily phenytoin) in ranges appropriate for epilepsy may be necessary, at least to control initial symptoms, although a much smaller maintenance dosage may be adequate thereafter. So predictable and powerful is the relief that if the patient does not respond at least partially to carbamazepine, reconsider the diagnosis of idiopathic trigeminal neuralgia. Once a patient experiences breakthrough pain on a single agent, a second and even third additional medication may be required to restore relief. If this dosage does not relieve the discomfort adequately, administer a higher dose. Many adverse central nervous system (CNS) effects (eg, vertigo, sedation, ataxia, diplopia) are associated with carbamazepine, which may make it difficult to use in elderly patients. The dose may be tapered once pain is controlled, since remission may occur. Gabapentin has demonstrated effectiveness in trigeminal neuralgia (TN), especially in patients with multiple sclerosis (MS). In an early study, Sist et al reported 2 patients with trigeminal neuralgia whose condition had a response to gabapentin,  1 of whom was previously unresponsive to carbamazepine. Phenytoin has the same mechanism of action as carbamazepine and poses a similar risk panel, except for the risk of aplastic anemia. Of those patients who fail to attain relief with carbamazepine alone, an additional 8-20% of patients may have an adequate response if phenytoin is added to the treatment regimen. Baclofen may be effective in patients with trigeminal neuralgia. [43, 44] Tizanidine was investigated in a few trials but did not show significant benefit. Commonly, baclofen is added to anticonvulsants when breakthrough symptoms occur. The National Institutes of Health (NIH) is also investigating the use of dextromethorphan in doses much higher than those used in over-the-counter cough preparations. A randomized, double-blind, cross-over trial compared 6 weeks of oral dextromethorphan with active placebo (low-dose lorazepam) in 19 patients, stratified into 3 groups: 11 with facial pain and possible trigeminal neuropathy, 5 with anesthesia dolorosa, and 3 with idiopathic trigeminal neuralgia. Dosage was titrated in each patient to the highest level reached without disrupting normal activities. Dextromethorphan shows little or no analgesic efficacy in pain due to possible trigeminal neuropathy and anesthesia dolorosa. Additional trials are necessary to conclusively evaluate the efficacy of NMDA-receptor antagonists in trigeminal neuralgia. Over time, the drugs used for the treatment of trigeminal neuralgia (TN) often lose effectiveness as patients experience breakthrough pain. For patients in whom medical therapy has failed, surgery is a viable and effective option. According to Dalessio, 25-50% of patients eventually stop responding to drug therapy and require some form of alternative treatment. The clinician then may consider referral to a surgeon for one of the procedures discussed below. Among patients who develop trigeminal neuralgia when younger than 60 years, surgery is the definitive treatment. Many operations have been offered to patients in recent decades. Local ablation of the peripheral nerve and wide sectioning of the sensory roots largely have been abandoned. In the past, alcohol or phenol injection was given to the affected nerve, with the goal to destroy selective pain fibers. Although it was an easy procedure, the success rate is low, in part because of a low selectivity of effect on the fiber type with this substance; recurrence rates are around 50% at 1 year. Rhizotomy or tractotomy was recommended if pharmacologic treatment was unsuccessful. Neurosurgery is generally more helpful in those patients with paroxysmal rather than constant pain and in patients whose pain follows the anatomic distribution of one or more trigeminal distributions rather than being spread diffusely. The various operations often fail after 1 or several years of initial relief. This requires a repeat procedure, often with improved but still incomplete results. Thus, many patients eventually restart pain medication after surgery. Surgery appears to be less effective for trigeminal neuralgia secondary to multiple sclerosis (MS). The success rate varies according to the experience of the surgeon or the anesthesiologist, and, therefore, surgical correction should be performed only by experienced surgeons. Surgical therapy can be divided into procedures on the nerve or gasserian ganglion (external or percutaneous, usually performed by pain management specialists) and on the nerve root (open skull surgery called microvascular decompression and performed by neurosurgeons, and gamma-knife radiation performed by radiation therapists). Three operative strategies now prevail: percutaneous procedures, gamma knife surgery (GSK), and microvascular decompression (MVD). Ninety percent of patients are pain-free immediately or soon after any of the operations,  although the relief is much more long-lasting with microvascular decompression. Percutaneous surgeries make sense for older patients with medically unresponsive trigeminal neuralgia. Younger patients and those expected to do well under general anesthesia should first consider microvascular decompression—presently, this is the most cost-effective surgery although it is also more invasive. Pain-free intervals after percutaneous procedures (percutaneous retrogasserian glycerol rhizotomy [PRGR] and percutaneous balloon microcompression [PBM]) last 1.5-2 years, 3-4 years after another (percutaneous radiofrequency trigeminal gangliolysis [PRTG]), and 15 years commonly after microvascular decompression. Those in whom the first percutaneous procedure fails may undergo a repeat procedure, which usually provides relief. More recently, however, posterior fossa exploration has frequently revealed some structural cause for neuralgia (despite normal findings on computed tomography [CT] scans, magnetic resonance images [MRI], or arteriograms), such as an anomalous artery or vein impinging on the trigeminal nerve root. 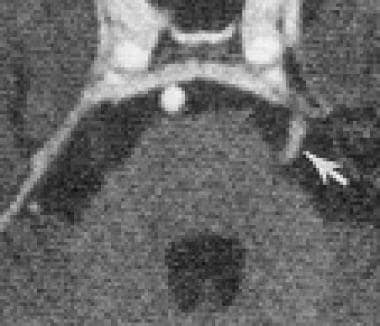 In such cases, simple decompression and separation of the anomalous vessel from the nerve root produces lasting relief of symptoms. In elderly patients with limited life expectancy, radiofrequency rhizotomy is sometimes preferred, as it is easy to perform, has few complications, and provides symptomatic relief for a period. The cost per quality adjusted pain-free year was $6,342 for glycerol rhizotomy, $8,174 for microvascular decompression, and $8,269 for stereotactic radiosurgery, according to Pollock and Ecker. 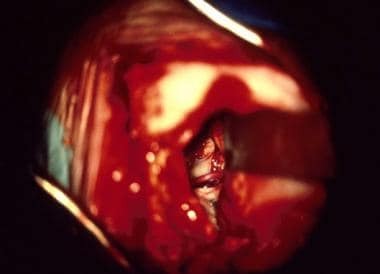 In 2005, approximately 8000 patients with trigeminal neuralgia underwent surgery in the United States, at an estimated cost exceeding $100 million. Surgery exposes the patient to operative risks and the risk of permanent, residual facial numbness and dysesthesias. The primary complications of surgery include permanent anesthesia over the face or the troubling dysesthetic syndrome of anesthesia dolorosa—often disabling, is occasionally worse than the original trigeminal neuralgia, and is often untreatable. For this reason, procedures with the best long-term success and the least risk of a residual facial dysesthetic syndrome are the most promising. Many patients require pain medication even after surgery. Jannetta pioneered microvascular decompression (MVD). This procedure is commonly performed in younger, healthier patients, especially those with pain isolated to the ophthalmic division or in all 3 divisions of the trigeminal nerve and in those with secondary trigeminal neuralgia (TN). It is now the most common surgery performed for trigeminal neuralgia and general anesthesia is required. See a surgical image below. Patients spend 4-10 days in the hospital and another week convalescing at home. Thus, recovery is more prolonged than with percutaneous procedures. In addition, mortality for this more invasive procedure approaches 0.5%. Serious morbidity includes dizziness, temporary facial palsy, cerebrospinal fluid leaks, meningitis, cerebellar stroke, and hearing loss, which may occur in 1-5% of cases. Also see Trigeminal Neuralgia Surgery. Percutaneous procedures usually can be performed on an outpatient basis under local or brief general anesthesia at acceptable or minimal risk of morbidity. For these reasons, they commonly are performed in debilitated persons or those older than 65 years. Zakrzweska and Thomas described 3 types of procedures: percutaneous radiofrequency trigeminal gangliolysis (PRTG), percutaneous retrogasserian glycerol rhizotomy (PRGR), and percutaneous balloon microcompression (PBM). Patients are left with minor, local, residual facial numbness after PRTG; may occasionally lose sensation after PRGR; and rarely do so after PBM. In each procedure, the surgeon introduces a trocar or needle lateral to the corner of the mouth and, under fluoroscopic guidance, into the ipsilateral foramen ovale. The ganglion is lysed at this location. Percutaneous procedures and surgery yield the best results when applied early in the course of trigeminal neuralgia. Even if medical treatment comes first, trials, when they are adequately completed and the agent is deemed ineffective, should be followed promptly by the next trial in order not to delay and decrease the efficacy of more invasive treatments. Percutaneous radiofrequency rhizotomy and percutaneous microcompression with balloon inflation are relatively inexpensive and accessible techniques, and they are less invasive than surgery, with a lower (long-term) efficacy-to-recurrence ratio. A comparison of the two techniques found them both effective with a median duration of pain relief of 21 months after PRGR and 20 months after PBC. The result is highly dependent on the surgeon's skill. General anesthesia is required. In PRGR, a spinal needle likewise penetrates the face, this time to the trigeminal cistern, at which point a cisternogram is obtained with water-soluble contrast material. After removing this material, the surgeon instills anhydrous glycerol, asking the patient to remain seated for an additional 2 hours to fully ablate the nerve. Gamma knife surgery (GKS) has become more widely available since 2000. This surgery is less technically demanding, less operator-dependent, and less invasive than the percutaneous procedures. It is among the newer techniques for treating trigeminal neuralgia and has fewer complications. Gamma knife surgery appears to be about as effective (80% of patients) as the percutaneous procedures but takes weeks to months to bring relief, which may be too long for some patients, and costs slightly more. This procedure consists of multiple rays (>200) of high-energy photons concentrated with high accuracy on the target (ie, trigeminal nerve root), [64, 65] destroying specific components of the nerve. Of those treated, 60% of patients are immediately free of pain, and more than 75% of patients have greater than 50% relief after 1.5 years. Recurrence rates are around 25 % between 1 and 3 years. The device contains a stable source of radiation (60-Co) that frees this technique from requiring an external source of radioactivity (eg, cyclotron). See the image below. The pain recurrence rate is low for patients who initially attain complete relief. Gamma knife surgery is generally effective, even in patients in whom previous surgery or medication trials failed. New facial numbness or paresthesias develop slowly over the first 12-15 months after gamma knife surgery, reaching bothersome levels in 9-20% of patients. Neurosurgical consultation is needed when medical treatment does not effectively control episodes of breakthrough facial pain. Pain management specialists may also be consulted for intractable pain. Longitudinal follow-up care is important because of the chronicity of trigeminal neuralgia, and because many treatments fail to maintain their efficacy (eg, pharmacologic, procedural). In patients treated with carbamazepine or phenytoin, obtain a blood count during the first few weeks of therapy (ie, monthly for at least 3 mo for carbamazepine, once after 2 wk for phenytoin), every time the dose is adjusted or adverse effects appear, and yearly thereafter. Agranulocytosis and aplastic anemia are extremely rare adverse effects, but suppression of the white blood cell (WBC) count in the range of 2000-3000 103/µL is not uncommon. This mild suppression of the WBC count does not warrant discontinuation of carbamazepine therapy. Hepatic function should also be monitored. Up to 70% of patients receive complete or acceptable partial relief, at least temporarily. Oxcarbazepine is a newer agent that may have fewer side effects, but it can cause hyponatremia, which should be monitored with serial serum sodium measurements in the first few weeks of therapy. Patients who experience breakthrough pain may need an increase in the dosage of their medication, if tolerated, or the addition of a second anticonvulsant medication or baclofen. No published data from randomized, prospective, controlled studies are available to guide clinicians regarding multidrug therapy, leaving providers to empiric trials of one agent or another. Neurologists caring for younger patients (< 60 y at onset) should consider early neurosurgical consultation, even after a negative magnetic resonance image (MRI) of the brain. Surgical procedures occasionally can afford complete relief, delaying the need for anticonvulsant medications for many years, if not permanently. Monitoring patients after procedures or open skull surgery helps screen for complications such as corneal abrasions and anesthesia dolorosa.